When Toure Muhammad organized the first Taste of Black Chicago last year, his goal was to showcase Black-owned restaurateurs, caterers, and bakers from across the city and to help them find new customers. So many people showed up that vendors sold out of food. Before the day was over, people were asking about plans for next year. “I was totally caught off guard by the number of people who attended,” said Muhammad, founder of Black Chicago Eats. 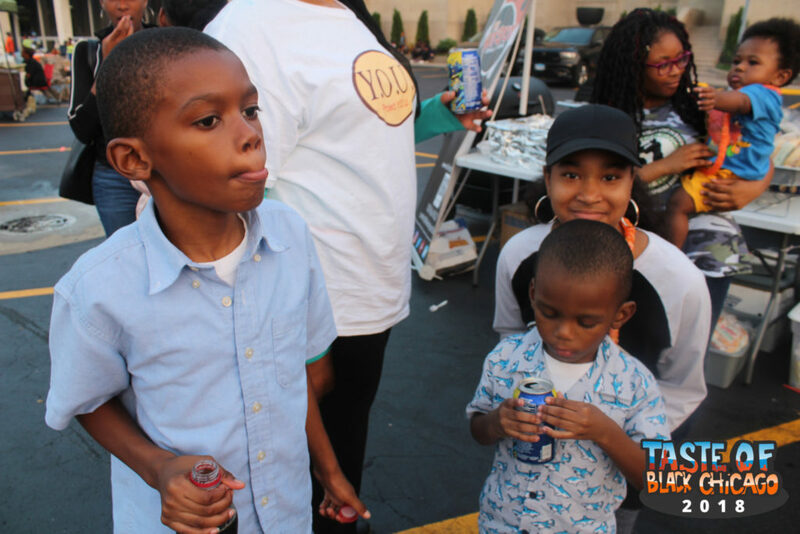 At the second annual Taste of Black Chicago, held last month again in the parking lot of Mosque Maryam in South Shore, 9,000 people stopped by to eat and enjoy the company of a welcoming and festive Black community. An estimated $70,000 to $80,000 was spent on the more than sixty vendors present, which included food vendors as well as those selling jewelry, hair products, and clothing. The event, which was co-organized with the Chicago Women Empowerment Group and Black Chicago Eats, was a more relaxed and family friendly event than the better known Taste of Chicago. There was music, and giant inflatable bouncing houses set up for kids and, of course, lots of good food. All day long, the parking lot was thick with the smell and sounds of chicken sizzling on grills. There was chicken any way you wanted it—jerk, chicken with dry rub, chicken slathered in barbecue sauce, even vegan chicken nuggets, sold by a surprising number of vegan vendors. “That consciousness [of veganism] is definitely growing in our community,” said Zarakyah Ahmaeiel, one of the proprietors of Soul Vegan, a McKinley Park-based catering business making its first appearance at the Taste. There were also vendors with the standard summer fair goods: shaved ice stations where customers pumped their own flavors of brightly colored syrup onto cones of ice, vendors selling funnel cake and deep-fried Oreos. Because the event was at a mosque, no alcohol was sold on site. Instead, attendees found refreshments at vendors like Chatham’s Oooh Wee! Sweet Tea, which offered regular tea flavors like peach in addition to flavors like the Beyoncé or the Obama, a delicious purple concoction that came in a large eye-catching mason jar. Those looking for Southern comfort food would have been happy sampling dishes from Luella’s Southern Kitchen, a Lincoln Square restaurant. The eight-dollar shrimp and grits featured four tender, plump shrimps in a bed of creamy grits and a rich brown rue, which owner and chef Darnell Reed was busy cooking on the spot. Attendees hoping for a slice of one of Brown Sugar Bakery’s famously decadent cakes were instead given $5 coupons to the Greater Grand Crossing store. Stephanie Hart, the owner, handed out coupons this year instead of setting up a vendor booth because she didn’t want to compete with the other bakery vendors there. Her purpose at the event, Hart said, was to get the word out about the variety of Black-owned businesses in the city. Imani Muhammad, the owner of Imani’s Original Bean Pies, sold throughout the South Side and south suburbs, said that after the event last year she noticed a large increase in the number of sales, both in store and online. “I believe it gave more customer awareness to the fact that we were in stores,” she said. Imani’s Original Bean Pies started out as a homeschooling project for her kids studying the nature of the navy bean and grew into a business with its pies found in stores like Whole Foods and Pete’s Fresh Market. A slice of their original bean pie topped with cream cheese frosting was delicious, with a dense, creamy filling and a buttery crust. The event brought people from all over. One group of friends had residents from South Shore, Hyde Park, St. Louis, and Milwaukee. They were seated at a quiet shaded area set up with tables and chairs for attendees looking to relax. Nearby, kids took turns horseback riding on two horses that walked up and down a long grassy stretch. Tammy Xu is a contributor to the Weekly. She last wrote for the Weekly about Redlined, Linda Gartz’s memoir on redlining in West Garfield Park in June. Chicago is such a great city. It doesn’t matter what you’re looking for, you’re going to find it. Some of the food is amazing and it comes from a place that you would never expect. I can’t tell you how many times I finally got around to trying a new restaurant, only to find out how good they are. I don’t know if it’s a lack of marketing, over saturation (so many good spots) or what…but festivals like this are a life saver! I love going and being able to try so much in the same area. I’m already thinking about next year! Thanks Toure!